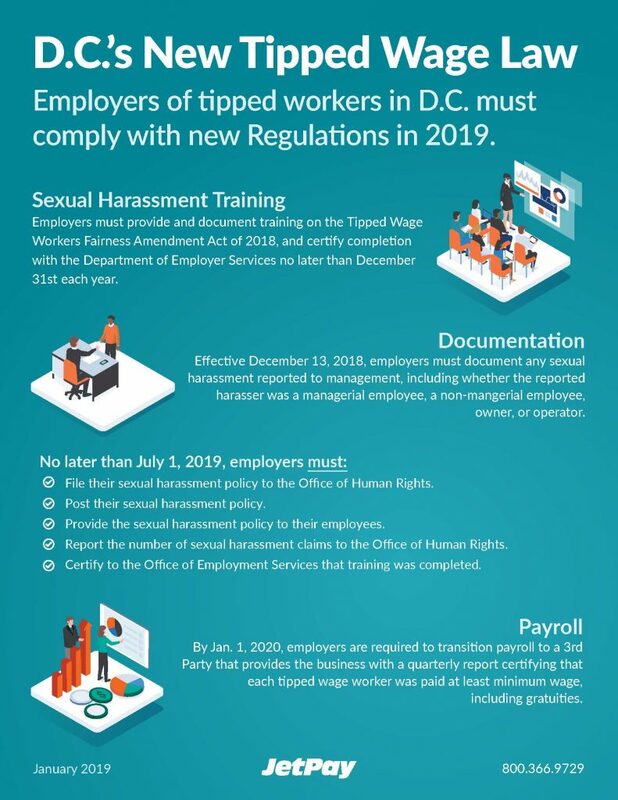 If you have tipped employees working in Washington D.C., you will be responsible for a number of specific compliance regulation changes in 2019 and 2020 regarding an increase of sexual harassment training, sexual harassment documentation and a shift in payroll reporting. The Tipped Wage Workers Fairness Amendment Act of 2018, passed December 13th of 2018 in D.C., has a large effect on the human resources departments for a variety of businesses. To help you better understand the changes, we have compiled a summary of the compliance changes. First, employers are required to provide and document sexual harassment training on the Tipped Wage Workers Fairness Amendment Act of 2018. and must also certify the completion of this training with the Department of Employer Services, no later than December 31st, every year beginning in 2019. Second, documentation of sexual harassment is required to be monitored to a greater extent. Effective December 13, 2018, employers must document any sexual harassment reported to management. Regardless if the reported harasser was a managerial employee, non-managerial employee, owner or operator. Regardless of the level or position the individual has, the documentation of sexual harassment is required to be equally monitored and filed. Employers must file their sexual harassment policy to the Office of Human Rights. Employers must post their sexual harassment policies. Employers must provide the sexual harassment policies to their employees. Employers must report the number of sexual harassment claims they document to the Office of Human Rights. Finally, employers must certify to the Office of Employment Services that the sexual harassment training was completed by all their employees. The third change in compliance required by this new law is in regard to payroll reporting. By January 1st of 2020, employers are required to transition payroll to a 3rd party that provides the business with a quarterly report certifying that each tipped wage worker was paid at least the minimum wage, including gratuities. Unsure where to begin adjusting your policies? Look no further! We are providing free sexual harassment compliance training, to help you comply with the second regulation. We are also waiving the fee for set up and implementation for our HR services, if you sign up by April 2019. Worried about what outsourcing your HR entails? Check out this blog to understand the fundamental benefits this includes and how you can save time and money! Contact JetPay for help implementing these changes.